He also somehow found the time to create this handy bottle opener to hang on the wall. As if we weren’t already impressed, he tells there’s a pellet bin project in the works too. Stay tuned for an update on that! Do you have any wood pallet DIYs to share? Tell us about them in the comments or on our Facebook page! There’s a lot of information within the pellet heating industry to digest – especially when wood pellet home delivery by the pallet is involved. The purpose of this blog post is to cover some of the basics that are to be expected for your order. Have you heard about our referral program? 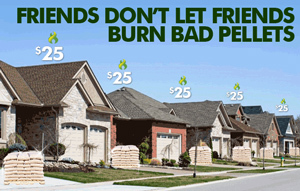 You can get $25 in credit added to your account every time you successfully refer a new customer to Woodpellets.com! Once your friend’s first order is delivered, you will automatically be credited $25 for your next order. So, if you’re happy with our service, our products and our convenient delivery…share the pellet love! Many folks don’t have the space to keep their wood pellet fuel stacked on pallets as delivered. Although storing wood pellets outside is possible and very common, we’ve noticed our customers often have our delivery drivers place the skids near an entrance to the house for re-stacking inside. New York, Vermont, New Hampshire, Maine, Massachusetts, Rhode Island, Connecticut, Pennsylvania, New Jersey, Delaware, Maryland, Washington D.C. will experience wet conditions that may linger in most of the area (especially in New England) but the weekend should be fair. New York State Thruway, South of Buffalo. Photo by NYS Police. Is a Garage Delivery of Wood Pellets Right for Me? The Woodpellets.com Premier Delivery option involves the use of a pallet jack. This special tool is a hand-operated machine that lifts heavy pallets, allowing delivery drivers to pull skids of fuel over flat, smooth surfaces like a cement floor. Because of their maneuverability and small size, pallet jacks give you greater flexibility than forklifts to place pallets exactly where you need them. 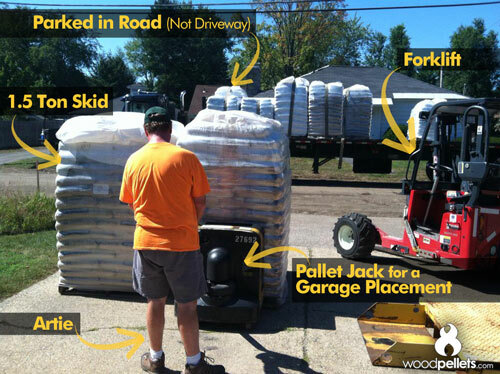 To see if a pallet jack delivery is an option in your area, call 1-800-PELLETS or visit Woodpellets.com for a free quote! Every year, we hold a pre-peak season delivery meeting to make sure we’re equipped to make our customers happy. It’s great to get everyone together in one place, but even better to go over the whole delivery process as a team. In order to make your Woodpellets.com home delivery as smooth as possible – we thought it’d be helpful to share an overall guide. The more information you provide, the better. Does your road have heavy construction going on? Is your driveway hard to find? Does your address not come up on GPS? If our drivers know ahead of time what to be prepared for, we can better serve you. It’s better to be up front about any tricky circumstances especially, so the delivery team can do all that’s possible to find a solution ahead of time. The forklift is bigger than you may realize. It’s actually over 8 feet wide, and the highest point is also 8 feet tall. It’s mounted on the back of the truck, which parks in the road. The driver lowers it down to the ground, uses it to remove your fuel from the truck, and then drives it up your driveway to place the pallets where you need them. Due to the heavy weight of the load and the forklift itself, it can’t be driven across any leach fields, sprinkler lines, or soft lawn. Keep this in mind when you’re deciding where to have your pallets of fuel placed! Communication is key! Our delivery team will send you an email, text your phone, and/or call you (whichever way you’ve indicated you prefer) to confirm your delivery. Also, sometimes we reach out ahead of time to confirm your delivery instructions or to get clarification on something. If you get a message requesting a call or email back from our team, please don’t forget to do so! Depending on the information we require from you, we probably won’t be able to schedule a delivery if there are unanswered questions pending. If you have a very specific placement requirement, mark it. 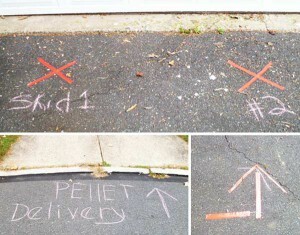 Many driveway deliveries have instructions like this: “Please place pallets in front of the garage door”. This is vague, usually because the customer wants the pallets near the door, so he or she can bring the bags inside to hand-stack. On the other hand, if you want a much more specific location for placement, mark the space with a sign, or an overturned trashcan, and let us know your indicator. Our driver will do everything possible to safely deliver your pallets where you want them. The forklift’s path must be clear. Forgetting to move cars out of the way is a common mistake, and one that can really make for a more difficult delivery. Keeping a clear path (at least 8 feet wide, including any turns) for the driver is important, not only for saving time – but for protecting your belongings. Our drivers are very careful and skilled, but as we mentioned before, the forklift is pretty bulky and difficult to maneuver in tight spaces. Note: Moving cars, toys, and equipment out of the way is important – but so is getting kids and pets out of the area! Keeping children and any pets inside during delivery is very helpful to the driver. There are already many variables to think about during a delivery, so avoiding the addition of small running bodies to the mix is crucial. You don’t actually have to be home. If your schedule isn’t meshing with ours, it’s totally fine. As long as your instructions are clear (see above) and you let us know exactly where you’d like your fuel (see below), our driver can handle it in most situations without your physical presence. We also have your contact information in case something comes up, of course. Note: Garage deliveries often involve the customer being at home, to open the door to allow the pallet jack to place the fuel inside. However, many customers are fine with leaving the garage door open if they can’t be home at the time of delivery. It’s all about whatever you are comfortable with! Regarding garage delivery: Are we able to move around in the garage for your Premier Delivery? Now that you’ve cleared your driveway for our equipment, have you cleared a path in the garage for the pallet jack? This is another overlooked step at times, unfortunately. The pallet jack, while smaller than the forklift, is still a heavy-duty piece of equipment, moving a 4-foot wide pallet of fuel. Make sure all the stuff that tends to accumulate in the garage is cleared out of the path of your fuel’s final destination. See our quick video below, which shows a Premier Delivery in action! We are always happy to answer any questions you might have. Please give us a call at 1-800-PELLETS to speak to a pellet expert, or visit our website at www.Woodpellets.com for more information. We hope this guide on home delivery has been helpful! 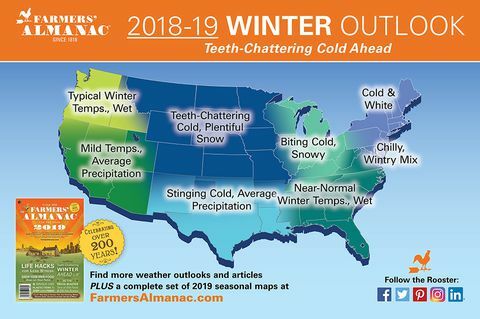 Although the Old Farmer’s Almanac recently released predictions about a mild, average winter…the other Farmers’ Almanac has released a very different forecast. Founded in 1818, the Farmer’s Almanac is known for long-term weather forecasts generated by a mathematical and astronomical formula first used in 1818 by founder David Young. This long-standing formula uses sunspot activity, planet positioning, tidal action and a variety of other factors to work. The exact formula is carefully protected by the Farmers’ Almanac organization – known only by their weather prognosticator who goes by the pseudonym of “Caleb Weatherbee”. The Almanac, which provides 16 months of weather forecasts for 7 zones, is predicting winter 2019 to be “colder-than-normal…from the Continental Divide east through the Appalachians.” The report also warns of above-normal snow accumulation for the Great Lakes states, Midwest, and central and northern New England, with the majority of it falling in January and February. Whether you follow long range weather forecasts or not, we’re here to help. To speak to a Woodpellets.com expert, call 1-800-PELLETS! About 50 miles west of Columbus Ohio, the His Hands Extended Sanctuary in St. Paris provides medical care, food, and shelter to homeless pets that would otherwise be forgotten. The organization notes that what’s also very importantly provided is “lots of love – to begin the rebuilding of shattered lives.” His Hands Sanctuary not only facilitates the adoption of these animals into loving families, but also provides a comfortable lifelong home for those not adopted. A simple post on the rescue’s Facebook has sparked a touching series of donations…and a new way to manage their fuel delivery. With many buildings for the dogs and cats who live there, the sanctuary relies on multiple wood pellet stoves for heat. The post explained how the sanctuary uses wood pellets to keep the animals warm, and that “any help with this huge expense will be wonderful”. They asked for any willing donors to call Woodpellets.com to contribute directly to the pellet fund. It wasn’t long before the sanctuary had four donated tons in their account. 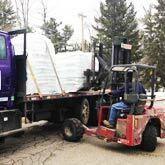 In the past, volunteers have donated their time and effort to hauling in pallets of wood pellets in multiple trips from a box store. The whole team was so touched by this example of community giving, Woodpellets.com will deliver all future His Hands Extended Sanctuary wood pellet orders for free. If you’d like to learn more about this organization, you can visit their Facebook page here. The Woodpellets.com team had the amazing opportunity to attend this year’s CHaD Battle of the Badges game in Manchester New Hampshire’s Delta Dental Stadium. It was a perfect night for a fun group outing and some friendly competition! Each year, a team of local NH police officers take on a team of local firefighters in a battle of “Good vs. Good” to fundraise for the Children’s Hospital at Dartmouth-Hitchcock, and this year’s event raised over $124,000! We are very proud to have several firefighters on our Woodpellets.com delivery team, and we were thrilled to cheer them on while supporting such a great cause. Will There Be Another Pellet Shortage? WoodPellets.com is the nation’s leading online retailer of wood pellet fuel, offering home delivery to customers on the eastern seaboard from Maine to Maryland, and in select areas of the Midwest and West Coast, as well as nationwide truckload delivery of 20 tons or more.